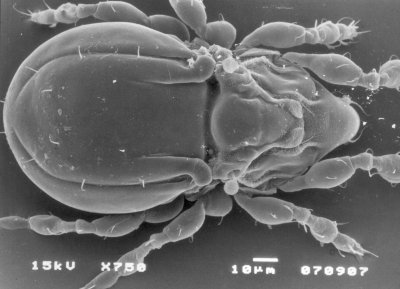 The Quadroppiidae are a family of oppioid oribatid mites with relatively elongate costulae on the prodorsum. Characters (from Norton & Behan-Pelletier 2009): Length 150–230 µm. Chelicerae with dentate chelae. Costulae longer than half length of prodorsum, without anterior cusp. Notogaster with nine pairs of setae, all similar in size and shape; crista present, one-third length of notogaster or longer. Borders of epimera III and IV meeting medially; epimeral border IV present; coxisternal setae setose. Solenidion ω2 on tarsus I arising close to famulus; ω1 on tarsus II positioned medially on segment.